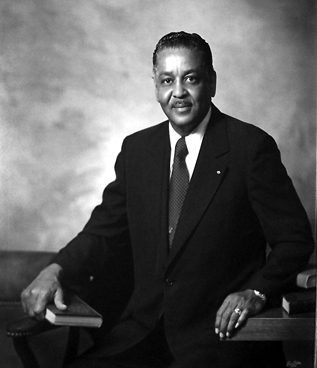 Clarence Everett Lightner, the first popularly elected mayor of Raleigh, North Carolina and the first African American elected mayor of a metropolitan Southern city, was born on August 15, 1921 to Mammie Blackmon and Calvin E. Lightner in Raleigh. His father, Calvin, founded the Lightner Funeral Home. Lightner graduated from North Carolina Central College (now North Carolina Central University) in Durham, North Carolina, and then studied at Echols College of Mortuary Science in Pennsylvania so that he could to continue working at his father’s business. While at North Carolina Central Lightner was a star athlete and was eventually inducted into the NCCU Hall of Fame. Lightner was also a member of the Omega Psi Phi Fraternity, and he served in the US Army for three years during World War II. After the passing of the Voting Rights Act of 1965, Lightner was one of the first African Americans elected to political office. He promoted his business and community leadership as qualifications for a seat on the Raleigh City Council, which he won in 1967. Lightner served on the City Council from 1967 to 1973. In 1973 Lightner was elected mayor, defeating white businessman G. Wesley Williams. Lightner was elected in the same year but just months before Maynard Jackson won the mayor’s office in Atlanta, Georgia. Jackson’s achievement in a larger city overshadowed the historic significance of Lightner’s election. Lightner became a charter member of the Southern Conference of Black Mayors, a parent organization of the National Conference of Black Mayors. Elections for mayor in Raleigh are held every two years and Lightner, a Democrat, was its mayor from 1973 to 1975. To date, Lightner has been the only African American mayor of Raleigh. His election did draw some national attention because only 16% percent of the registered voters in Raleigh were black, and in the mid-1970s it was indeed rare for a majority of Southern white voters to elect an African American to any office. Even more surprising was that Lighter’s race was hardly mentioned in the campaign. After serving one term as mayor, in 1977 Lightner was appointed by North Carolina Governor Jim Hunt to replace state Senator John Winters, after Winters resigned. Lightner served out the rest of Winter’s term, which amounted to about a year. Lightner had served as chairman of the Board of Trustees at Saint Augustine’s College, and as a member of the Board of Trustees at North Carolina Central University for ten years. From 1993 to 2001 Lightner was chair of the Southeast Raleigh Improvement Commission, during which time the commission completed the economic development study that is still the guideline used for developing southeast Raleigh, implemented the Small Business Success Program, and created the small business incubation program, which led to the opening of the Raleigh Business and Technology Program. In recognition of Lightner’s political achievements and support for higher education, he was awarded honorary doctorate degrees from Shaw University, Saint Augustine’s College, and his alma mater, North Carolina Central University. After suffering a long illness, Lightner died on July 8, 2002. He was survived by his wife, Marguerite Massey Lightner, and three children, Clara Lightner Sharpe, Deborah Lightner Yancy and Bruce Lightner. He also had a son named Lawrence Lightner, who preceded him in death.